Discover how this simple training technique and targeted exercise system can “electrify” your workouts! Get ready to embrace new levels of personal power while you improve strength, flexibility, and fitness. By incorporating these easy and effective Pulse-Power exercises into your workouts, you will see rapid improvements in core support, balance, and body control. 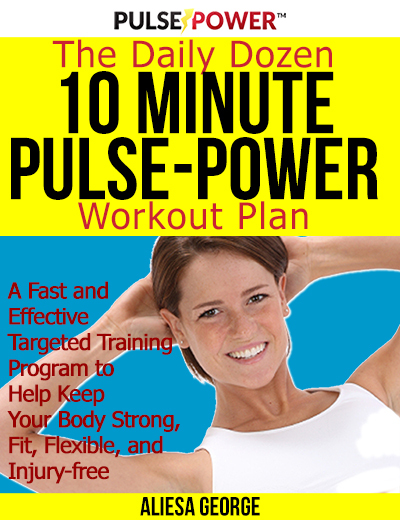 This .epub digital book includes easy-to-follow, “how-to” directions for 12 effective Pulse Power exercises that you can do in ten minutes or less, for a quick, efficient, at-home workout. Use the Pulse Power Daily Dozen exercises as a stand-alone quick training program, or as a warm-up before more intense workouts. If you run, walk, dance, do Pilates, lift weights, or any other sport or activity… Adding Pulse Power training with The Daily Dozen to your weekly workouts can help you stay healthy, active, and injury-free.